BALFOUR, Arthur James, 1st earl of (1848-1930). Prime Minister 1902-1905. 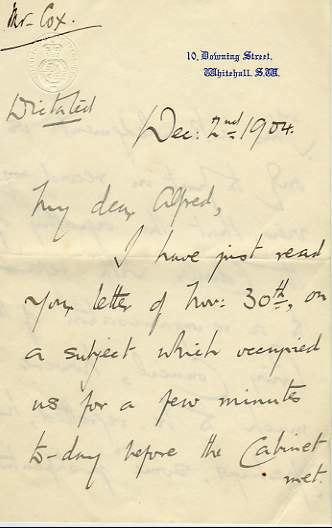 Letter Signed ('A.J.B. '), as prime minister, to 'My dear Alfred (headed 'Mr. Cox'), 3 pages 8vo, 10 Downing Street, 2 December 1904. Concerning the attitude of the colonies to a re-organisation of the Privy Council. The image links to a larger or more detailed version.